Days 37-45: Mark and Melody are back with updates after crossing Iowa! SUMMARY: It was a week with no internet, no cell phones and not enough sleep. Nothing but family, friends, fun, camping, eating, biking and beer. That’s Ragbrai. A bike ride for 420 miles across Iowa with 17,000 + people with corn, pie, ice cream, Mr. Pork Chop and you-name-it. And what a week it was! Here is a little slide show to give you an idea of what it was like for the members of our Team Sally’s Folly (named after Mark’s cousin Sally). The week started with Mark riding into Glenwood, Iowa and reaching a milestone of 2000 miles since he started biking across America. It ended with a ceremonial tire dip in Mississippi River in Muscatine. Congrats to all! MARK: I was joined for the 420 or so miles of biking over the rolling hills of southern Iowa by my daughter, her boyfriend, one of her friends and her dad, and my cousins Mike, Sally and Shannon. We all rode. We all got sore. We griped a little about the hills, the camping conditions, and the challenges of grinding out miles, day after day after day. But we also reveled in the experience. Our group rode the miles. Grinded out the hills. We ate, drank and slept RAGBRAI for a week. And that’s not all. (To find out more about Mark’s ride across Iowa and to see more pics and read more about what it was like for him to do the Ragbrai with daughter Jenna, click here to his blog). MELODY: Because I didn’t ride (I was busy shooting some videos for the charter company we went with), I made the slide show to give you an idea of what it was like to be part of Ragbrai. I will also post some videos, including the slo-mo arrival at the end of the ride and a look back at the first month of Mark’s bike ride across America (below). I will say that camping with 450 people is, um, quite an experience. Overall it was a great experience and I’m glad we got to share it with people who are special to us. Next up: Illinois. 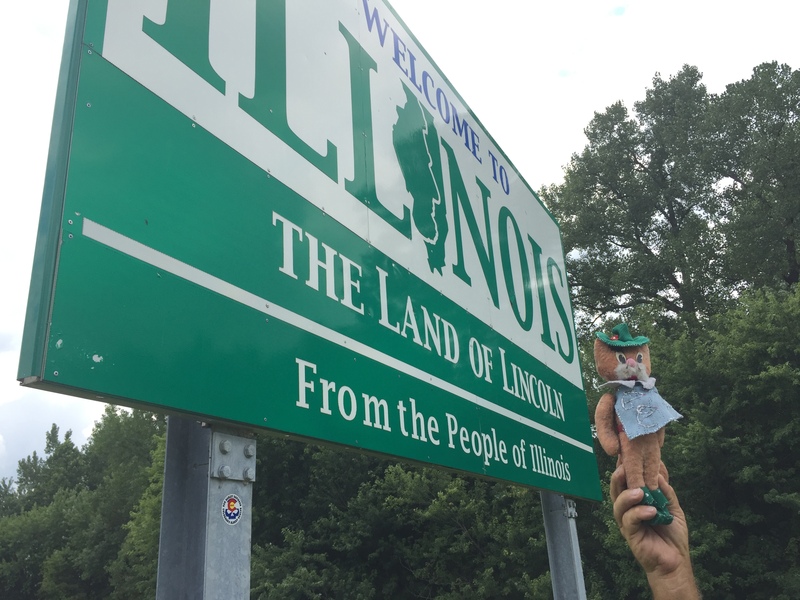 We are already here and catching up (and the doll given to us by one of our former students from AUBG is enjoying seeing so much of America, as we promised). Thanks for following along our #55andalive journey from #OregontoDelaware! You can also follow us on Facebook here.